Thermal printing, two-color receipt and label printing, 5.9 ips, 3.5 inches print width, USB interface, auto-cutter, no peeler, label software CD and US power supply included. Color: White. Cables not included. See accessories. 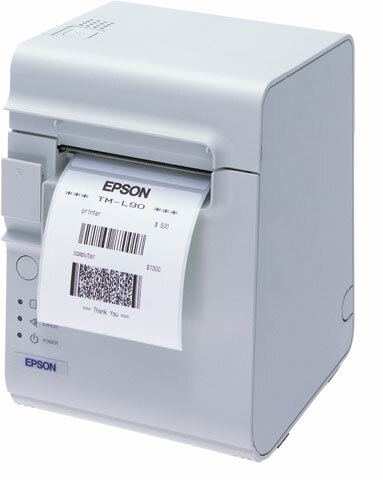 Thermal printing, two-color receipt and label printing, 5.9 ips, 3.5 inches print width, serial interface, auto-cutter, no peeler, no software CD and US power supply included. Color: Gray. Cables not included. See accessories. Thermal Printer, 203 dpi, 90 mm, USB Interface, Peeler, and PS180 Power supply. Color: Dark gray. Thermal printer, prints at 203 dpi, includes power supply and cutter, 10/100Base-T/TX Ethernet interface, one/two-color thermal printing. Color: Dark gray. Thermal printing, two-color receipt and label printing, 5.9 ips, 3.5 inches print width, parallel interface, auto-cutter, no peeler, label software CD and US power supply included. Color: Gray. Cables not included. See accessories. Thermal printing, two-color receipt and label printing, 5.9 ips, 3.5 inches print width, parallel interface, auto-cutter, no peeler, label software CD and US power supply included. Color: White. Cables not included. See accessories.